You were given a traffic violation by a police officer and are now in the position of figuring out what to do about your Nassau County traffic ticket. You are probably wondering how can you get out of paying this ticket, or how you can fight this in traffic court. Do you have a defense or should you just plead guilty and pay the fines? On what grounds can you fight your ticket? Or, you may have a court date already set and need representation. In each of these cases, knowledge of traffic law is essential, as well as hiring an experienced traffic ticket lawyer who can either dismiss the ticket, reduce the ticket to a lower infraction or violation, or reduce the points that end up on your license. At the Law Offices of Michael W. Alpert, our Nassau County traffic ticket lawyer understands the consequences you will face for committing different types of traffic violations in New York. The impact of a traffic violation can cost you a lot of money or take away your privilege to drive for a long time and that is why we handle every case seriously down to the fine details. We have a proven track of record in successfully defending our clients’ traffic cases. 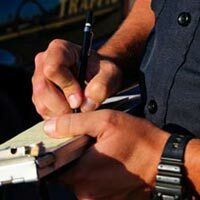 We can help you resolve your traffic citation on the best possible terms. We’ll even review the ticket via email or on the phone with you as part of your consultation so that we can talk about what your traffic defense strategy in front of a Nassau County Judge might be, or how we will approach getting your ticket reduced. We fight aggressively to get all traffic violations dismissed. In many cases, you do not even need to appear in the court, which saves you time and money. It also is less disruptive to your busy work and personal schedule. Call 516-280-7288 for a FREE consultation. Why Hire A Traffic Ticket Attorney in Nassau County? Peace of mind. Hiring a traffic attorney will free you from stress. An experienced attorney most likely knows the outcome and the possible penalties you may incur. In most situations, the chances of a ticket dismissal or reduction of points are greater when you hire an experienced lawyer in advanced. When you are properly represented inside the court room, you have a higher chance of winning your case. Our ticket lawyers know the court language and the local judges. This makes it more efficient to handle arbitration and litigation more effectively. If your case requires you to appeal the court’s decision or persuade the judge to reduce the points or lower the associated ticket fines, we can also help you. Saves you more money. In many cases, hiring a Nassau County traffic ticket attorney will cost you lesser than the fines you may be liable for, should you plead guilty or lose. Your auto insurance rates could go up due to traffic ticket convictions, point accumulations or a suspended driver’s license. And all other moving violations in New York. For information about associated ticket points, visit DMV Point System in New York page. Get Your Nassau County Traffic Ticket Dismissed or Reduced. Contact Us Today. The Law Offices of Michael W. Alpert will defend you in Court. Our traffic defense lawyers in Nassau County have extensive experience in fighting almost every type of traffic tickets. Call 516-280-7288 to set up a FREE consultation with Michael Alpert, Esq. To learn more about the different traffic ticket fines and penalties in New York, visit the Department of Motor Vehicle’s page here.